Seiko Men’s SKA366 Kinetic Black Ion Watch: Loosely translated, Seiko (Seikosha) means “House of Exquisite Workmanship” and the Black Ion certainly lives up to that standard. The dial is dark and touched with gold accents in a sleek, but subtle combination of strength, style and function. The watch is kinetically powered by the movement of your arm and never needs a battery or winding. The flowing artistic detail complements with charm and confidence. 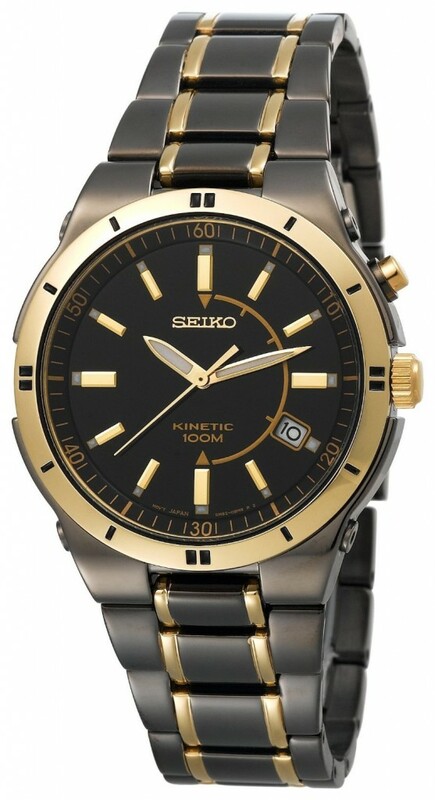 The Seiko Men’s Kinetic Black Ion Watch offers luxurious style at an affordable cost. The unforgettable black finish highlighted by golden tones is made of quality stainless steel with a Hardlex crystal dial window. The rechargeable battery is also self-charging, working by simple movements of your wrist. This process uses kinetic energy which is captured and stored for up to six months. This watch features a round face, analog display type and water-resistance of up to 330 feet.